VANCOUVER - Some pale whales appear to tan in order to protect themselves from sunburn, says a new study. An international team of scientists took mitochondrial DNA samples from blue whales, fin whales and sperm whales to check for genetic damage from ultraviolet rays. They found that higher melanin levels in the whale's skin correlated with lower levels of skin lesions and DNA damage, suggesting melanin protects the ocean mammals from sun damage. "We found molecular evidence that blue whales increase production of melanin, so this would indicate that they tan," Karina Acevedo Whitehouse, a zoologist from the University of Queretaro in Mexico, and one of the authors of the study published Friday in the journal "Scientific Reports." "Increasing their pigmentation (tanning) appears to be the way blue whales protect themselves from UV damage." They also found that the ability to modify skin pigment — or tan — may be linked to migration patterns. Blue whales are believed to be the largest animal to have ever lived on Earth at up to 30 metres in length with hearts that can weigh as much as a car. They're found in every ocean in the world, spending summers in polar waters before migrating toward the Equator for winter. The palest of the three study whales, with mottled blue-grey skin, they appear to adjust their pigment as they move from higher UV environments to lower. In contrast, fin whales, the blue whale's darker-skinned, stay-at-home cousins, showed a reduced ability to change the level of melanin in their skin. Rather, fins maintained higher levels of melanin and had the lowest prevalence of sunburn lesions. Sperm whales reacted differently yet. These ocean behemoths, with their rounded foreheads and the largest brain of any creature in the world, did not show a spike in melanin production but appeared to respond with increased production of repair genes. The researchers believe the difference may lie in their behaviour, which sees sperm whales spend more time on the surface of the water, exposed to UV radiation. It suggests that, like humans, they may acclimatize to UV exposure. "Whales are the UV dosimeter or barometer of the oceans," co-author Mark Birch-Machin, a professor of molecular dermatology at Newcastle University in the United Kingdom, said in an email. Although measures have been put in place, substances released into the environment decades ago continue to deplete the ozone layer in the atmosphere, the study said. Other ocean species have been shown to tan, it pointed out, including hammerhead sharks and some fish. The researchers did not find evidence of skin cancer in the whale biopsies, but did find DNA damage that could potentially lead to cancer. Birch-Machin said the presence of skin cancer in whales is something he hopes to investigate in the next study. Both scientists said environmental changes to their ocean habitat, including climate change, could compromise the whales' ability to protect themselves from UV radiation and other challenges. The study is the first to look at the potentially distinct evolution of these whale species to combat the effects of UV radiation. It also provides information on changing global climate conditions, information that could potentially be applied to human skin research into aging and skin cancer. 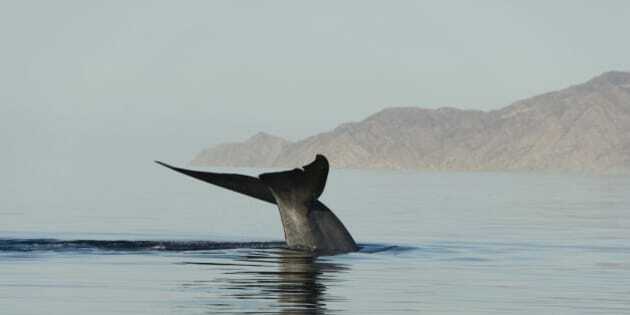 "And it is pretty cool to show that whales, indeed, appear to tan," Acevedo-Whitehouse said.